Not one post this weekend....I'm sorry. In my defense I had a very busy weekend. I got my hair done on Saturday then was out for a birthday. I went Costco Christmas shopping with my mom on Sunday plus a trip to Dollarama, then wedding dress shopping with my friend (she found it!) and then was over for dinner at John's parents. I thought I'd do a quick post this morning to make sure there's more to this blog than just Christmas posts...at least for another week-ish. Then it's Christmas 24/7. 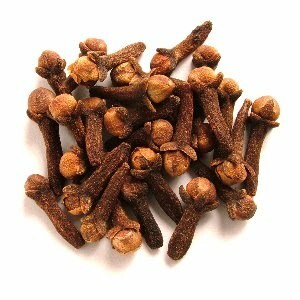 Today I want to bring to your attentions what is perhaps my favourite winter/holiday spice: Cloves! They may not look particularly pretty but you use ground cloves for baking and it's the smell that I love. They are expensive, just a heads up. If you enjoy the smell though it's money well spent. I put some cloves and cinnamon in my coffee this morning. Sprinkly it over the ground coffee before you turn the machine on...it makes coffee sooooo good. I usually put nutmeg on there too when I'm going for the "holiday blend" but we're all out of nutmeg so I'll have to wait until I get a chance to hit the grocery store.